An Excel drop down list is a useful feature when you’re creating data entry forms or Excel Dashboards. It shows a list of items as a drop down in a cell, and the user can make a selection from the drop down. This could be useful when you have a list of names, products, or regions that you often need to enter in a set of cells. In the above example, I have used the items in A2:A6 to create a drop down in C3. Read: Here is a detailed guide on how to create an Excel Drop Down List. Sometimes, however, you may want to use more than one drop down lists in Excel such that the items available in a second drop down list are dependent on the selection made in the first drop down list. These are called dependent drop down lists in Excel. You can see that the options in Drop Down 2 depend on the selection made in Drop Down 1. If I select ‘Fruits’ in Drop Down 1, I am shown the fruit names, but if I select Vegetables in Drop Down 1, then I am shown the vegetable names in Drop Down 2. This is called a conditional or dependent drop down list in Excel. Select the cell where you want the first (main) drop down list. Go to Data –> Data Validation. This will open the data validation dialog box. In the data validation dialog box, within the settings tab, select List. In Source field, specify the range that contains the items that are to be shown in the first drop down list. Click OK. This will create the Drop Down 1. Select the entire data set (A1:B6 in this example). Go to Formulas –> Defined Names –> Create from Selection (or you can use the keyboard shortcut Control + Shift + F3). In the ‘Create Named from Selection’ dialog box, check the Top row option and uncheck all the others. Doing this creates 2 names ranges (‘Fruits’ and ‘Vegetables’). Fruits named range refers to all the fruits in the list and Vegetables named range refers to all the vegetables in the list. Select the cell where you want the Dependent/Conditional Drop Down list (E3 in this example). In the Data Validation dialog box, within the setting tab, make sure List in selected. In the Source field, enter the formula =INDIRECT(D3). Here, D3 is the cell that contains the main drop down. Now, when you make the selection in Drop Down 1, the options listed in Drop Down List 2 would automatically update. How does this work? – The conditional drop down list (in cell E3) refers to =INDIRECT(D3). This means that when you select ‘Fruits’ in cell D3, the drop down list in E3 refers to the named range ‘Fruits’ (through the INDIRECT function) and hence lists all the items in that category. Important Note: If the main category is more than one word (for example, ‘Seasonal Fruits’ instead of ‘Fruits’), then you need to use the formula =INDIRECT(SUBSTITUTE(D3,” “,”_”)), instead of the simple INDIRECT function shown above. The reason for this is that Excel does not allow spaces in named ranges. So when you create a named range using more than one word, Excel automatically inserts an underscore in between words. For example, when you create a named range with ‘Seasonal Fruits’, it will be named Season_Fruits in the backend. Using the SUBSTITUTE function within the INDIRECT function makes sure that spaces are converted into underscores. When you have made the selection and then you change the parent drop down, the dependent drop down list would not change and would, therefore, be a wrong entry. For example, if you select the ‘Fruits’ as the category and then select Apple as the item, and then go back and change the category to ‘Vegetables’, the dependent drop down would continue to show Apple as the item. You can use VBA to make sure the contents of the dependent drop down list resets whenever the main drop down list is changed. The credit for this code goes to this tutorial by Debra on clearing dependent drop down lists in Excel when the selection is changed. In the Excel workbook where you have the dependent drop down list, go to Developer tab, and within the ‘Code’ group, click on Visual Basic (you can also use the keyboard shortcut – ALT + F11). In the VB Editor Window, on the left in the project explorer, you would see all the worksheet names. Double-click on the one that has the drop down list. Paste the code in the code window on the right. 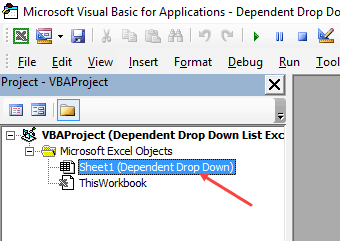 Now, whenever you change the main drop down list, the VBA code would be fired and it would clear the content of the dependent drop down list (as shown below). 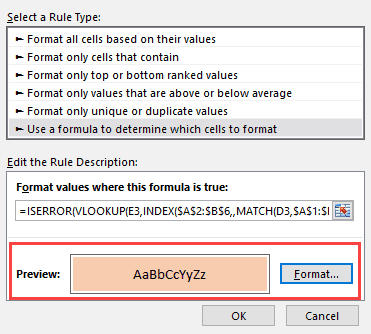 If you’re not a fan of VBA, you can also use a simple conditional formatting trick that will highlight the cell whenever there is a mismatch. This can help you visually see and correct the mismatch (as shown below). Select the cell that has the dependent drop down list(s). 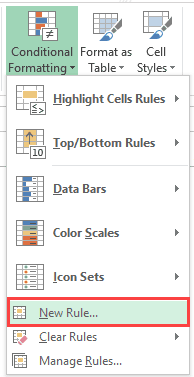 Go to Home –> Conditional Formatting –> New Rule. 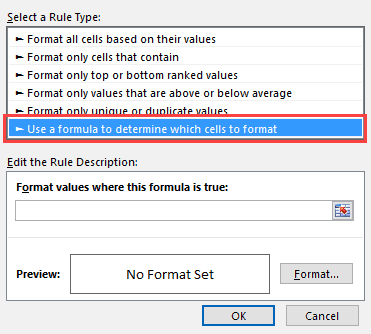 In the New Formatting Rule dialog box, select ‘Use a formula to determine which cells to format’. The formula uses the VLOOKUP function to check whether the item in the dependent drop down list is the one from the main category or not. If it isn’t, the formula returns an error. 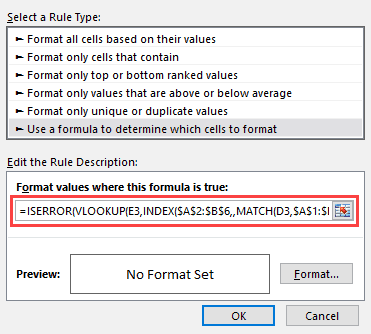 This is used by the ISERROR function to return TRUE which tells conditional formatting to highlight the cell. Extract Data based on a drop-down list selection. Creating a drop-down list with search suggestions. Select multiple items from a drop-down list. Create multiple drop-down lists without repetition. 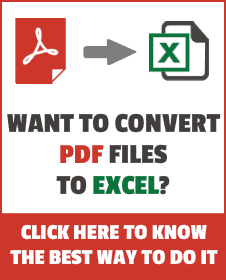 Save Time with Data Entry Forms in Excel. Mine isn’t working. I followed the steps exactly, but my second row for lists shows an arrow for a dropdown list, but doesn’t actually create a dropdown list based on the choice made in the first column. For clarification, when I attempt the second part of the Data Validation, I get an error message saying “The Source currently evaluates to an error.” But the first selection works just fine. Can someone please help me? for this formula —- what if I had three columns in my named ranged (not two) how would the match formula change? I have categories name with White spaces, drop down is not working in that case. Very excellent job, thank you very much. Wow! This was so helpful and exactly what I was looking for. I knew the solution had to be much more simple than I was originally planning to try. Hi Could you possibly help me with a slightly bigger formula? I have a issue with name box in excel, which does not accept hypen “/” for eg: “AM/NAME” , please give me suggestion for this issue. HI, How can I make the drop down list works for multiple cells and not just in a unique cell? How to update the dependent list when you change primary list after initially making some selection? Right now if you select the US and then Alaska, after that if you change it to India, the state still remains Alaska. Please help. Really appreciate the help. Please let me know if you are able to write VBA script which accomplishes the task. Thanks again. I want to create two cells dependent on the data entered into the first cell. So say I have a list of Company Branches listed by city. Then I have 6 multiple lists that list the Foremen that work in each city AND I have 6 lists of Superintendents that work in each city. I created the city list in cell B2. In the Superintendents cell E3 I used =Indirect(B2) and it lists all the Superintendents working in the city showing. Now in cell E2 I want to have the Foremen that work in each city. I tried =Indirect(B2) which gives me the same list in cell E3. How do I get E2 tied to B2???? Hi there, is there any way you know to do this but with a list of all countries and regions of the world without having to create as many columns as countries exist? I have the list with two columns, each row per region/country… When I select one of the countries, I need the drop down list to display all the regions of that country. 1 – While addition to the data set (As states) and consequently using indirect formula as Indirect(States Name) doesn’t show any options in list. 2 – Is there any way in which cells should appear empty for that particular row if we change any data set? Hey Sumit, I have a doubt – when you choose US in Cell -E2 then the other drop down list in cell:F2 shows US cities. Lets assume, we select Alaska as city in F2 but at the same time we change the country again US to India in E2, then F2 field still shows Alaska. Is there a way cell should appear empty if we change the country ? How do i fix this? its not letting me do the data validation following the exact steps. I also have the same mistake…anybody could fix it?